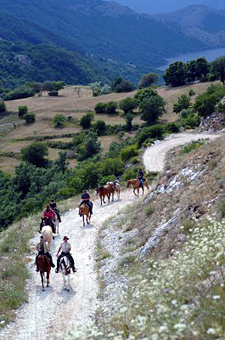 Hidden Trails’ Italian horse riding holidays are a time to indulge, relax, and lap up the essence of Italia. We have brought together some of Italy’s finest horse riding tours, each with their own uniquely Italian feel. Whether you are lured by the rich history stretching back to the ancient Roman empire, the long established culinary traditions, or simply the romanticism of a Mediterranean escape, Hidden Trails has a horseback vacation to suit. Italy is characterized by its style, exquisite countryside, long-held traditions, rich cultural heritage and cuisine. Our Italian horse rides aim to capture the essence of Italy – explore the vineyards and cellars of Tuscany, the coastlines of Campania, the castles of Lazio, and the volcanic landscapes of Sicily. On our Italian rides you will find yourself riding through centuries old olive groves, eating locally grown fresh produce, and meeting locals with a deep love for their country. Tuscany is a famed culinary region, and our finest tours combine excellent horse riding with the best gourmet Italian food and wine. On many of our tours you will stay in rustic farm houses, where you can dine on fresh pasta, fine goat cheeses, and local wine. Those wishing to explore the island of Sicily will find our Cefalu to Etna a particularly interesting option. Mt Etna is Europe’s highest active volcano, and here the horse treks follow ancient Roman paths and the luna-like trails of past eruptions. With so much to offer, exploring this beautiful country on horseback is the perfect way to discover Italy’s hidden jewels. Our Italian horseback vacations combine excellent equitation with history, culture and fine cuisine. The weather in Rome and central Italy during summer can exceed temperatures of 35ºC – making it sometimes unbearably hot. As such many businesses tend to close in August, as people take holidays in cooler climates. The best time to travel to Rome is in springtime, when skies are blue and the weather warm. Rain showers are possible any time of year. Mid-winter is mild, with the average temperature around 13 ºC. In the northern regions of the country summer temperatures fluctuate, depending on location. Generally Venice ranges in temperature from 30 - 33 ºC; whilst Milan can often exceed 35 ºC. Tuscany has a relatively mild climate – ranging between 20 and 27 ºC in summer. Southern Italy and Naples are often cooler in the summer, due to the Mediterranean climate. Southern Italy experiences sunnier, drier weather, and slightly milder temperatures ranging from 18 ºC to 29 ºC on average.